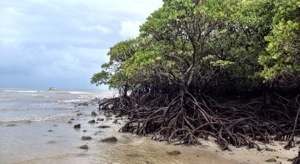 The rains stopped just long enough for a stroll along Cape Trib beach. 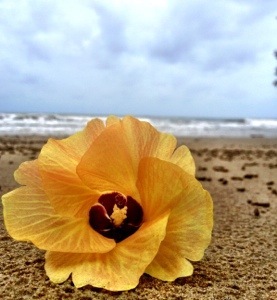 The beach was gorgeous, and being stinger season, it was completely deserted as well. 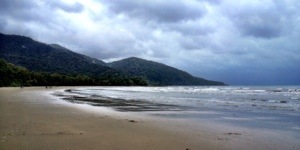 Cape tribulation is the only place in Australia where the jungle meets the ocean. Here, the Daintree Rainforest spills out into the sand and right into the sea, making for some pretty spectacular scenery. I walked up and down the beach for close to an hour, taking photos and walking in the surf. Unfortunately, the skies soon opened up again and it was time to go home. The lodge I was staying in was just feet from the beach in the middle of the jungle. The place was fairly empty… Except for the spiders. Every 10 feet along the path I ran into another spider on steroids. Massive orb spiders the size of my face hung in webs along the side of the little road to my room. Great. The one bug that I have a huge issue with. Why would I choose Australia as my travel destination when I hate spiders?! After hearing close to 100 tales of killer spiders from George on my way to Cape Trib, I was slightly unnerved when I was left alone in the jungle with all sorts of crazy insects. I had a room to myself, with my own bathroom, and was ridiculously over cautious about bugs for the first few hours. I turned on the light of the bathroom and stood carefully at the doorway, peeking in. I looked up at the ceiling, behind the door, under the toilet seat, in the shower curtain. I felt like a ninja sweeping my way across the bathroom looking for tiny enemies. In the end, I deemed the place safe… Until I found the hundreds of tiny ants crawling all over the toilet paper roll. C’est la vie, time to head to the bar. I spent the evening in the only communal place in the lodge: the restaurant/bar. Food prices were outrageous, with the cheapest meal going for about $25. I was glad I brought some makeshift sandwiches from Coles. So instead of eating I had a beer, read my book and watched the torrential downpour of rain. Monsoon season… Shoulda known. I was impressed that I made it to 9:00 before finally heading to bed. Of course, not before ninja-ing around my room for bugs first. The next morning was more of the same. Rain. Rain. Rain. So much rain I couldn’t believe there was still water in the sky. I had planned on going hiking, but the forecast said otherwise, so I had a much needed lazy morning before my bus at 1:00. As ridiculous as my previous two guides and had even more jokes to tell along the way. We stopped off for some homemade ice cream at this local shop in the middle of nowhere. Every day they make their own ice cream from fruits grown in the area. Each day there are four flavours and you must get a bowl with all four types. Sounds like an excellent plan to me! The four flavours of the day were passion fruit, jackfruit, soursop and wattle seed. All of them were incredible! I had tried jackfruit in Zanzibar and loved it! A sort of mix between a banana and a pineapple, it was one of the stranger fruits I have ever tried. But soursop and wattle seed were new to me! The soursop tasted like a lemony sherbet, and the wattle seed tasted exactly like coffee! Go figure! 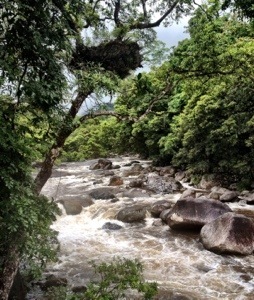 From the ice cream shop we carried on to Mossman Gorge. 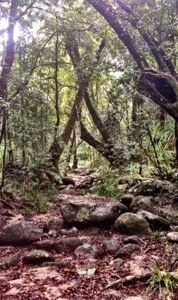 Despite the rains, Mossman was gorgeous! With a huge, raging river winding it’s way through lush green jungle, it was a great spot for photos. But the skies opened up again and so we cut our trip short and headed back to the van. On our final leg to Cairns we drove through the town of Port Douglas. Otherwise known as the gateway to the reef for the filthy rich. This is the place where celebrities and politicians and the rich and famous come when they want to see the Barrier Reef. Peter said it was a rare day if you didn’t see a celebrity walking down the main drag of Port. We drove up and down, trying to celebrity spot, but the rains apparently kept all the famous people away. If you had the money however, Port Douglas would be THE place to be. It’s beautiful and well kept and clearly a favorite destination for weddings. Having said that, the place is outrageously overpriced. Peter had said that a friend of his was told to leave and shop at Walmart next time because she ONLY spent $400 on a pair of sandals! He had thought it was much more acceptable to spend $2000… Pocket change, really. This entry was posted in Australia, Uncategorized by hilarylust. Bookmark the permalink.